In The Sparks, Ben Wilkinson meets a dark world with a light touch. These are poems of the city in the night and a young man's place at its heart. Even when the poems move out from an urban focus, it is to a rural world of missing walkers and lurking cars, a shifting pitch-black beach or a black-misted sea where trawlers roll like beasts. But the dark is lit by sparks of electricity, glowing cigarettes and a strange sun recalled from childhood. These are neat and clever poems. Poems from this publication previously appeared in Blackbox Manifold, Magma, Other Poetry, Poetry London, Poetry Review, The Frogmore Papers, The London Magazine, and the Times Literary Supplement. The Sparks is poetry responsive to the elemental layers that underscore the material sheen of our early twenty-first century. It is the work of a poet steeped in the masters, but not cowed by them. Its lines are stylish, fluent, its images incandescent. There is both achievement and promise here: achievement borne of a craft thoroughly learned; the promise that what Ben Wilkinson produces as he begins the difficult business of unlearning is worth the wait. These are the words of a writer sure of his craft [...] Armitage may be standing pretty close to his elbow, and Eliot has whispered a line or two, but you feel this poet has taken what he wants from these. Now he's preparing to go beyond them, into his own territory. Wilkinson has the strength to dare, and if we feel some of these stretches are a little precocious, they're worth it for the jolts and surprises and shifts that force a reader to go back and re-read. What strikes me most about Wilkinson's poems is their discursiveness, their willingness to extrapolate from the phenomena they record towards moral and philosophical conclusions. Such a method reminds me of the Romantics, and particularly of Wordsworth; but here Nature is replaced by the complicated, unsatisfactory, urban contemporary landscape. The poems [in The Sparks] have a story-telling impulse which is revolutionized by a refreshing range of subject matter: [...] there are reflections on Tesla’s coil, on trawler fishing, on being drunk and alone on Sheffield streets, on surrealism, on Blake’s angels, on moles as Lazarus, the coincidence of the crash of the money markets and a flash of lightning forking out of the sky. [...] A brave, colourful, finely crafted series of poems. As a pamphlet the length of this collection is just right. 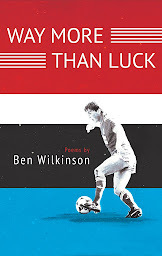 Poetry works in short bursts, especially here where Wilkinson threads his theme of light and darkness, of weather and the sparks that catch us off guard; epitomised through lighters sparking cigarettes and childhood awe at the world with dancing rain and laughing moons. But along these metaphorical guides in the dark, a tender softer side bursts through with gorgeous well-strung imagery. […] The Sparks is full of profound moments told in effortless clarity […] each poem is rich with unusual turns of phrase and glimmering original images bringing the elemental forces down onto the pub, the bedroom, and the many walks in-between. saw angels line the trees, beyond reach of metaphors. Available to buy @ tall-lighthouse press's website, here, from Sheffield Hallam University Blackwell's bookshop, or directly from me - just drop me an email if you're interested (listed on my profile page).